Brigadoon is an ongoing science fiction project following the life and times of the staff of a deep-space lodginghouse, which functions as a B&B for some, and a home for others. Embala was watching over the common room from the bar, her photosynthesis notes glowing softly on its surface under her bottle of cherry-flavored Fizztown Funk. The room was lit only by the glowing bar top, on which her father was standing, and stirring a large pot of stew. “Sounds like he’s a runner from the Homeworld Protectorate,” he said. The pot bubbled. Did they have a pot like that? Had she seen it before? She looked down again, and Henry was sitting across from her at the bar, glaring at a bowl of soup. He dipped in a ladle and pulled out a Homeland Protectorate badge with a tiny camera lens glinting in the glow from the bar. Henry tugged on her sleeve, and her father nodded. “It’s why the stew tastes so bad on Earth.” The badge vanished from the ladle and appeared pinned on the shoulder of her shirt as Henry tore the sleeve away. Henry sat back and pointed at his bowl of stew. She looked at her father as he poured a ladlefull of stew onto the bar top. She opened her eyes and tried to knock the bowl from Henry’s hand, giving herself a hard smack on the thigh. She blinked and rubbed sleep from her eyes. “On monitor,” she said, wiping her pajama sleeve across her mouth. With her other hand she tapped the wall next to her bed, and had a momentary rush of terror as the whole wall was replaced with empty space. The wall reappeared with a rectangular window in it about three feet across. In the center of the screen was a “Fishfrog” – one of the dozens of interchangeable budget star-hopper ships, capable of limited faster-than-light travel. It looked like a combination between a frog and a fish had been hidden somewhere inside a plain white cylinder with the arms of a cheap FTL drive sticking out of one end like an eight-pointed star. The other end was aimed to latch onto one of their jetties in about an hour. Embala glared at it. The computer chimed a confirmation and sent the message as Embala got dressed and shuffled off to the delivery bay. It took the whole morning to get the rest of the vent covers up, with Eagun helping Lisa and Anansi set up the farm. She grabbed a couple food bars from the kitchen and retreated to her room to review Brigadoon’s inventory for the rest of the afternoon. When she came to the dining hall in the evening, she found the guests and several crew members sitting together as Eight gently tipped a steamer full of dumplings onto a platter at the center of the table. She took a seat across from Eagun, and next to Lisa. The guests introduced themselves as Anwhar and Catherine. At dinner, the guests ate at one of the common tables with the crew. The husband, Anwhar, did most of the talking, not just for himself and his wife, but also for the rest of the table. He was eager to explain how they showed up so soon after Brigadoon had opened for business. Embala glanced at Catherine, as she sipped her tea without giving any indication of her opinion. Anwhar continued. “Wow. I keep forgetting people like you exist.” Ariadne’s muttered comment was clearly audible. She glared at Embala, who raised an eyebrow, thinking, you did volunteer for this. Eagun set his own cup down with a thunk. “My friends, you must forgive dear Ariadne! It is that same electricity that fills her veins and causes her words to arc so brightly, that lets her keep our little village here on the boundary of reality, and what lies beyond!” As he spoke, the lights seemed to dim. “She’s our electrician, is what he’s trying to say,” added Gregg. Red mist began to creep in from the newly darkened corners of the room. Lightning struck at one end of the room, and then froze in place. Another identical bolt struck next to it, and another, and another, until the perimeter of the room was a palisade of identical lightning bolts. Eagun cursed and poked at the part of the table he had leaned on. The lightning bolts and mist vanished leaving Embala with after-images filling her vision. Embala opened her mouth to apologize again, but Catherine cut her off. “Fair enough.” Embala hid a grin in her drink. Both of them had blushed when she called Anwhar her husband. Eagun did something on his control panel and the walls and ceiling of the room slowly faded away until they were sitting under a glass canopy with all of the universe above and around them. Embala’s gut clenched and she downed her drink. She raised her cup toward Eight with a pleading look as Gregg continued his story. Eight nodded and went to the bar. Embala nodded with the others. They had all heard stories about early matter forges going wrong. Eight came back with Embala’s drink, and she took it with a smile. It was some sort of cordial; sweet and strong. Embala looked up at the star-studded blackness around them and shivered. It was all too easy to imagine the normal rules of reality breaking down in that endless void. Gregg raised an eyebrow at Ariadne, and then shrugged. Embala finished her drink and glanced at Ahmed and Catherine. Both were listening with rapt attention, holding each other’s hands in a white-knuckled grip. “What happened to the ship?” Asked Catherine. “Good story, though,” said Lisa. “Who’s next? They traded wild tales of apparitions and disappearances since the advent of faster-than-light travel. Embala leaned on her elbows, slowly drinking the cordial Eight had poured her, and watching Eagun’s careful operation of the holo-control program he had opened on the table in front of him. When Gregg had told her that the whole station would be equipped for holo-projection and universal console access, she had been thrilled. The ability to bring projections from home with her had eased her fears for the psychological effect of living in a space station light-years from any inhabited planet. Looking around the table as Eagun played, she began to see the potential downsides. Most of the crew was just enjoying their drinks, stories, and the holo show, but Anansi was closely watching the control panel, and the glint in his eyes was not comforting. She gulped the rest of her drink and excused herself to find another. She had forgotten that one of her colleagues had chosen to name himself after a trickster god. At some point, the spider Mimic was going to cause trouble. Imagine a planet with no large carrion eaters. Animals die, and their bodies sit undisturbed. They bloat. They rot. They pile up until the dead overwhelm the living with stench and disease. Once upon a time, this was true for human society. We gave birth to massive machines and titanic towers, but childish creators that we were, we made a world without vultures. As the mouldering remains of our endeavors threatened to bury us, we created a savior to eat away the corpses that fouled our air and our water. Vulturecorp was born of humanity’s need, and it soared across the galaxy, stirring our bones and giving us new life. Any abandoned human working was their carrion, and everything they took was given new purpose and sold virtually at cost. Brigadoon was first built to house workers for some ancient mining corporation. When every planet in the star system had been consumed, they departed, leaving behind this one barracks. Hundreds, or even thousands of years later, Vulturecorp found the ancient relic, and shaped it into a modern Lodginghouse with a station-length Mattersmith Matter Forge, and even an “Outdoor Recreation Area”. Their work was excellent, and their parts well made. Embala knew all of this, of course, and felt sincere admiration for the company. Even the covers for the ventilation system showed the care with which Vulturecorp did their work – sturdy, easy on the eyes, and each one as good as the next. She was very sure of this last point because what looked like every single vent cover in the station was sitting, neatly wrapped, on the three pallets in front of her. She touched one of her ear studs to activate her com. “Bran.” There was a brief pause, then Bran answered. A smile tugged at her lips as she tapped her ear again. She ended the call. Brigadoon’s custodian was unlike anyone she had ever met, and she would be working closely with him. Less than a week since their arrival, and it was already clear that managing Brigadoon would be very, very unlike work at the comfortable Lodginghouse she had helped her parents run. Embala laid a hand on the wall by the pallets, calling a console into existence under her fingertips. She opened her favorite wallpaper, and turned to look at the rest of the delivery bay as the program loaded. Suddenly she was back in the little square in front of her childhood home on Ilgai. The early morning sun peeked through the forest of towers that was downtown, and a soft, silent snow was falling. She reached out her hand and let the flakes pass through it to add to the intangible dusting on the floor. There was a soft thump behind her and she spun to see what caused it. Erwin the cat had appeared out of nowhere to pounce on one of the illusory snowflakes. He now squatted, front paws outstretched and tail lashing as his gaze jerked from flake to falling flake. Embala walked over and stooped to pet him. He sniffed her hand, and the curled his paws in to sit, loaf-shaped, watching the snow. She scratched him behind the ears and the soft rumble of his purr started. “I suppose Brigadoon is home now, for both of us.” She sat next to the cat, her back against the pallet of vent covers. The purr continued. Embala glanced down at him. He looked up at her, stood, and left the way he came, vanishing through the wall of a nearby building. Embala frowned. The wallpaper vanished in time for her to see a dark, plush tail vanishing into the open air vent. Ilgai re-appeared, and the snow started falling again. There, ahead of the ship it lay! Brigadoon, enchanted refuge at the edge of space! Brigadoon, whose glimmering form lay ahead of us, given a misty halo by the Carina Nebula! And my hands did sweat as the ship docked, and my hands did tremble as I opened the door and stepped forward into a new world. Downcast I stood aside, and let our own lightning elemental sweep by, searing the world around her as she fled for the wires and conduits that welcomed her rage. And then she was gone, rolling down the jetty, followed by our chuckling comrades, and then by me. All of us were hushed as we entered the vast hall into which the jetties led, and the silence of ten thousand tons of empty rooms and hallways washed over us. My heart racing, I walked to the dormant fountain that ran the length of the room, slumbering in wait for us. I ran my hand along the smooth stone as I felt the vastness of our home spreading out around me. Then pain! Fearful, stabbing pain, like needles in my hand. I cried out and leapt away from the cursed fountain, glancing back in terror at the source of my torment. There, crouching upon the stone was a dread beast, with daggers for teeth, and needles for claws, its tail lashing as its evil, slitted eyes gazed up at me. And with that he was gone, his belongings floating after him. “I like you, Eagun, but don’t drag me or my teachers into this,” said Anansi, and he crept through a doorway and down the hall to his new lair. With grins suppressed and eyebrows raised, my companions followed, leaving me alone with my thoughts. The beast rolled before me in the fountain, displaying its fearsome armaments as it stretched out on its back. If you want to read more, you can head over to my patreon to get access, and to see what else you’ll be supporting! After my long silence on this site, I’m happy to announce that my circumstances have changed, and there’s going to be a lot more traffic here. As of yesterday, my own writing is now my only means of income, so you’ll be seeing a lot more of me. Some of that will be here, but a majority of it will be over on my blog, Oceanoxia. Part of my Patreon rewards setup is an ongoing science fiction series following the adventures of a group of friends who bought a fixer-upper space station from VultureCorp, Custodians of the Galaxy. Starting on July 1st, there will be daily updates for my $5+ per month patrons as the crew of Brigadoon manage their outer space B&B in an ancient mining company barracks station that was left behind by the miners for some unknown reason. Beyond the main story, which will occasionally have free chapters available here, there will also be other content from the various people staying at Brigadoon, and much of that content will be available at the Brigadoon Guest Registry. Halloween was just the beginning. I was raised on Tolkien. Every year around Christmas, in addition to reading Dickens’ A Christmas Carol, my family would also read a few of the Letters from Father Christmas that Tolkien wrote for his own children. For those who aren’t aware, Tolkien wrote a series of letters to his children claiming to be from Father Christmas. The letters contain all sorts of stories and illustrations about the goings-on at the North Pole, the antics of the North Polar Bear (the official one), what the elves that worked for him were up to, and so on. It was these letters, more than The Hobbit or The Lord of the Rings, that formed my view of goblins. The ones that Father Christmas dealt with were similar to the goblins of The Hobbit, but smaller, and in my opinion a bit stranger. I couldn’t make myself watch more than one of the new Hobbit movies, but the goblins shown in the first one were one of my favorite parts of all of Peter Jackson’s interpretations of Middle Earth. The creatures shown were all goblins, but they ranged in size from the massive king, to the little cackling messenger on a zipline. They were spooky and menacing and above all, they were downright weird! For me, goblins are like aliens that come from below, rather than above. They’re as much a part of our world as we are, but just as we are at home in the light of day, they are at home in the darkest places of the Earth. Maybe that’s why I see them as embodying strangeness. To be a goblin is to be at home in a world that fills humans with the terror of the unknown. 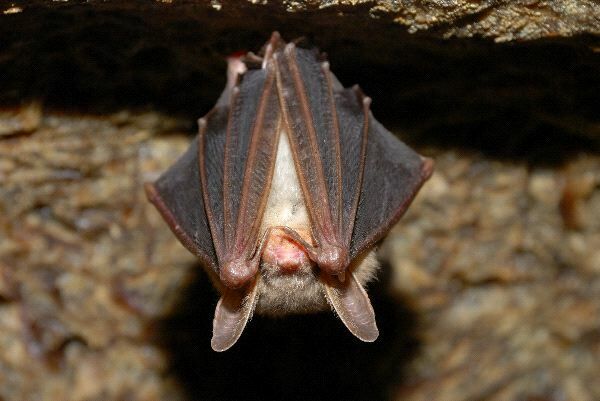 They come from that parallel Earth that gave birth to bats, goblin sharks, and glowworms. 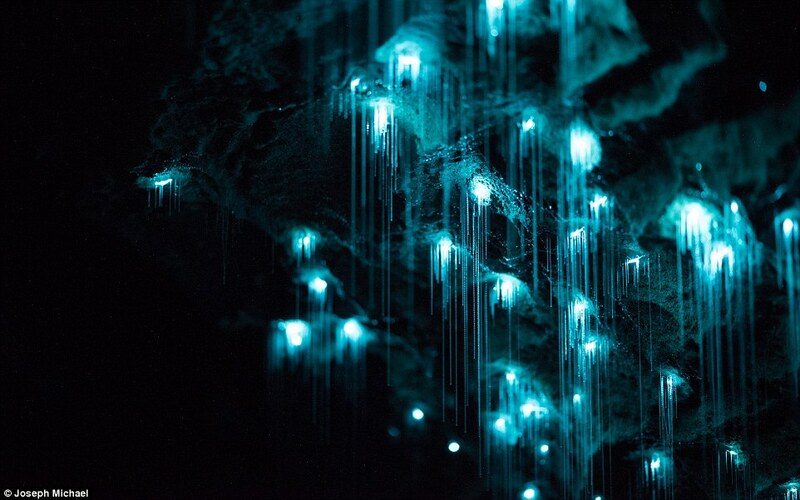 And then there are cave glow worms – in the light of day, they’re fairly normal insect larvae. Not pleasant to look at (for most of us), but not terribly interesting either. At home in the darkness, however, they form a glowing constellation across the ceilings of their caves, beautiful, but deadly for any insects that wander too close to the slimy strands hanging down below the lights. If they get caught, they’re reeled in by the worm, and devoured. In the world of goblins, light is dangerous. It lures you to death, or reveals you to predators. Autumn is the time when our world begins to be more like their world, for a little while. As Halloween arrives, the trees are losing their leaves, and the birds are flying south, and the light that we value so much is fading day by day. October 31st has come and gone, and America will now be obsessed with Christmas for the next couple months (with a passing nod to Thanksgiving), but that is just a distraction from the truth. As the last glow of the sunset fades, night is only just beginning. Halloween has passed, and now night is really coming. The long darkness and cold has driven the goblins with which we have become familiar into hiding. Now is the time for the goblins that we don’t know about – the ones that revel in the cold darkness beyond the edge of our fire light. Exits and Entrances is now available! I’m pleased to announce that my first novel, Exits and Entrances is now available in paperback and e-book formats on Amazon.com! This is the culmination of years of writing, learning, and re-writing, and I’m delighted to have it out! My publisher described the book as a metaphysical fantasy, and I think that’s a good fit for it. This novel is the first of a trilogy, with book two well underway. I invite you all to read it, and to tell your friends about it. He had once climbed the stairs of the Empire State Building, and that didn’t take half the time he was spending on these. Anthony was also fairly certain that he knew of no buildings with black marble stairs of such great width. He couldn’t see the walls on either side of him now, just darkness. Wisps of pale green mist gathered around him, glowing faintly without lending any light to their surroundings. Anthony paused to look back. The stairs behind him were a well of darkness out of which reached faint tendrils of the luminous fog. After what seemed like hours, he reached a door. It was unquestionably a door. Anthony was utterly certain that it was a door, but he couldn’t tell if it was a normal roof exit door, or a huge wooden door with wrought-iron hinges, or a house door, or a gate. It seemed to be all doors at once. Not flickering exactly, but not remaining in one guise either. Anthony realized that all the doors he had ever seen in his life were merely imitations or reflections of this door. Leaving such a door closed was not an option. Mouth dry and hands sweating, he opened it and stepped through.